I decided to try something different. Instead of the usual Friday follows (which I was starting to get burned out by and haven't done in ages and now there are so many different ones that I wouldn't know where to start...), I thought I would try hanging out with the Tuesday girls for a change. Follow Me Back Tuesday is hosted by Survey Junkie, Little Yaya's, Review Retreat and Boobies, Babies & A Blog and follows the same premise as the Friday ones. Follow the hostesses and as many other blogs as you like. Leave a comment letting the blogger know you are now following them and wait for them to follow you back. Easy, Right? Click on the link and get started! Hi am your newest follower. Thank you for following me on Follow Me Back Tuesday.Have a wonderful day. Checked out some of your Art and Crafts for kids...what super ideas! 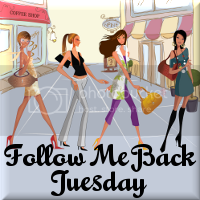 Following from follow me back tuesday! I am a new follower. Love the sidewalk paint my daughter and I are going to love that! Hope you have a terrific Tuesday, and I look forward to reading more of your blog. Already following you, but stopping in to show you some FMBT love! Thank you for coming over to The Coupon Posse' and following us, we are following back :) I can see us stopping by regularly, between the 4 of us that publish our little blog, we got 15 kids and that side walk paint recipe you posted is going to be very popular around our homes :) Thanks again! Hi! I'm following you back! Thanks for stopping by and becoming my follower :) I'm following you back! Hi Charlene! Thanks for linking up with Follow Me Back Tuesday again. I am already following you ;) Hope you're having a great week! Mine has been busy with a sick family, ugh. Have a happy and safe 4th of July Weekend! Stopping by from SITS to say hi! Have a wonderful day! Well, it's not tuesday, but I saw you on SITS and loved your blog:) I'm your newest follower. Looking forward to more of your adventures in mommy land! i really like your blog. found you from SITS. im following! !